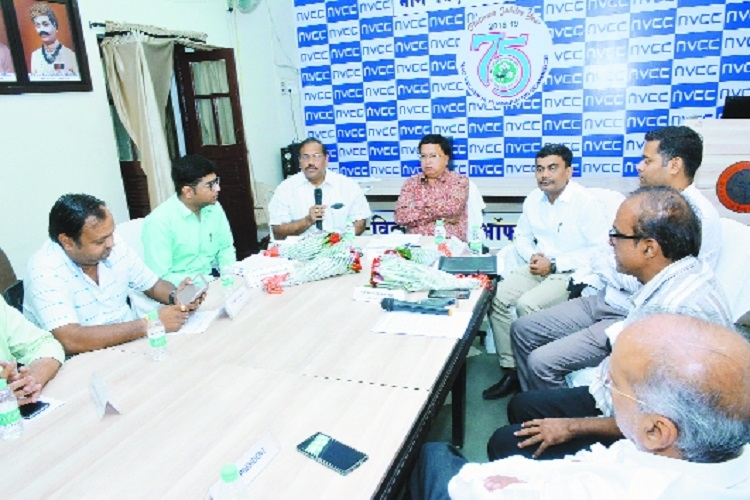 Nag Vidarbha Chamber of Commerce (NVCC) organised a workshop on settlement scheme to clear all the unresolved disputes during pre-GST era right from BST and MVAT Act. Maharashtra Government has issued an Ordinance to bring into effect a scheme that provides for settlement of dues under various state levies, including VAT, CST, Entry Tax, Professional Tax, Luxury Tax, and Purchase Tax on sugarcane. M M Kokane, Joint Commissioner of State GST (Admin), Sunil Lahane, Deputy Commissioner, A Muley, Assistant Commissioner and CA Ritesh Mehta were chief guests. Hemant Gandhi, President of NVCC welcomed M M Kokane by offering him shawl and shreefal. Earlier, there used to rise in tax collection by 15 per cent which has dropped to 7.5 per cent after introduction of Goods and Services Tax (GST). The Settlement Scheme will be implemented in two phases. The first phase will be implemented from April 1, 2019 to June 30, 2019 and the second phase will be from July 1, 2019 to July 31, 2019. The cases pending since 1964 to March 31, 2010 and from April 1, 2010 to June 30, 2017 will be cleared. He called upon traders to take optimum benefit of the Settlement Scheme. CA Ritesh Mehta gave detailed information about the cases that would be covered in the Settlement Scheme. Sunil Lahane replied to the queries raised by the members of the Nag Vidarbha Chamber of Commerce (NVCC). Hemant Gandhi requested M M Kokane and Sunil Lahane to extend the date of the second phase from July 31, 2019 to November 30, 2019 so that maximum traders should take maximum benefit. He appealed traders to take benefit of the scheme. Present on the occasion were Prakash Wadhwani, Past President, Prakash Mehadia, Immediate Past President, Farooque Akbani, Umesh Patel, Shabbar Shakir, Rajubhai Makhija, Sanjay K Agrawal, Secretary of Nag Vidarbha Chamber of Commerce and large number of representatives from various trade associations were present.